Truxor DM 5045 is a professional working machine with high performance. It is equipped with a 45 hk turbo diesel motor. A larger motor with greater moment provides more power to the machine and the tools. 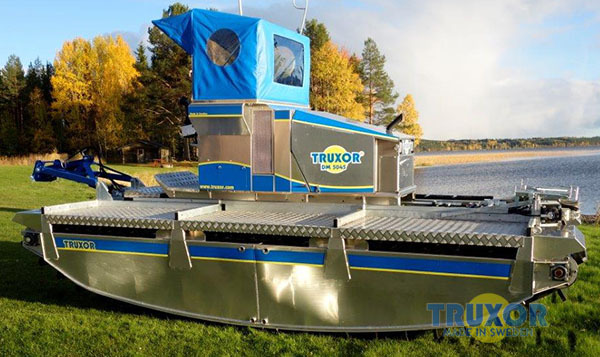 Truxor DM 5045 has a hydraulic system equipped with a patented cyclone tank that provides more efficient ventilation and thereby slower oxidation of the oil. Thanks to the reduced amount of oil, we have managed to compensate the weight of the heavier motor, which has a positive effect on the machine's performance. The control system is based on a CAN bus technology which makes the machine easier to drive and provides more functions. Motor: Kubota V1505-T turbo diesel 44.9 hp / 3000 rpm. Environmental class Interim TIER 4 / Stage 3 A. Euro class 3 Built-in stop function if engine overheats or oil pressure is too low. Maximum gradient warning system stops the diesel motor automatically if the maximum gradient is exceeded. Driver seat: Ergonomically designed, adjustable driver seat with thermostat-controlled electrically heated seat, foldable cab, adjustable steering. Electrical system: 12 V, 60 A generator, 45 Ah battery, driver seat adjustable thermostat. Hydraulic system: Hydraulic tank with cyclone technology 19 litres, volume of hydraulic system 36 litres. Load-sensitive hydraulic pump, torque 115 Nm. Control system: CAN bus signal-based technology. All functions are regulated by CAN bus technology. Automatic cut-out if the level in the hydraulic tank is too low. Left joystick: For driving the machine. Hydraulic outlet 1 – working pressure 140 bar, adjustable flow 0-20 l/min. Hydraulic outlet 2 – working pressure 130 bar, adjustable flow 0-11 l/min.